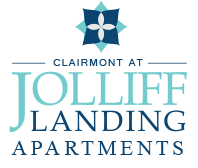 Welcome home to Clairmont at Jolliff Landing Apartments, a premier-luxury community located in Western Branch. Enjoy exquisite amenities, features and an ideal location with our brand new one and two bedroom apartment homes. Enjoy upscale and sleek interior finishes and private patios and balconies, spacious walk-in closets, high ceilings and plantation blinds. Within our gated community, you will have access to our resort-style pool, poolside entertaining area with bar seating, gas grills, hammock park and an expansive 24/7 fitness center with yoga area, multiple lounges, billiard room and a movie theater. The combination of a beautiful, luxurious community and our professional on-site staff, make Clairmont at Jolliff Landing a community where dreams come home.